China is a massive country in East Asia, spanning from the Middle East to the East China Sea, to the west of Japan, with a population of over one billion. What is the country like? With a landscape as vast as its history is long, China is often described as many different countries put together, encompassing almost every type of natural scenery. It has expansive grasslands and rice terraces in the south, the deserts of Inner Mongolia, mountains along the northeast and fourteen thousand kilometres of coastline with some beautiful beaches along the way. Home to the world’s oldest continuous civilisation, records of Chinese human history can be traced back to over 2000 BCE, when the Xia Dynasty and its seventeen emperors ruled for nearly five hundred years. One of China’s biggest appeals are, unsurprisingly, its incredible monuments of antiquity, luring almost a hundred million tourists each year, if including the special administrative regions of Hong Kong and Macau. 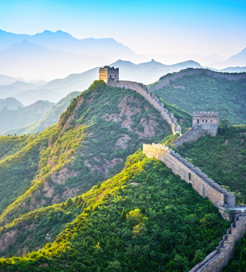 The Great Wall, spanning over twenty one thousand kilometres, is perhaps China’s greatest feat, while the Forbidden City Palace in Beijing, and terracotta army, just outside Xi’an, make for unforgettable experiences. Given the sheer number of inhabitants, including around fifty six ethnic groups, the national culture is hugely dynamic. The world famous cuisine varies greatly between regions, the most well-known hailing from Hong Kong, Shandong, Jiangsu and Sichuan, centring on rice, noodles and dumplings. Also famed for its celebrations, one of the best times to visit China is during the Spring Festival, marking the beginning on the Lunar New Year from mid-January to mid-February, with a different event for each day ranging from breath-taking firework displays to sampling unique dishes like rice congee. Beijing, the enormous capital, is known for its ultra-modern buildings juxta-positioned against the city’s millennia-old history, the Tiananmen Square and the National Museum of China, featuring an array of fascinating cultural artefacts. The biggest city, however, is Shanghai, on the central coast, with its glorious waterfront and six hundred and thirty two metre-high namesake tower. Getting the ferry to China? The ferry industry in China is one of the most developed in Asia, with market leading operators using top-of-the-range, high-speed vessels for routes from Macau and Hong Kong to a few Chinese ports. These journeys are quick, regular and reliable, with some crossings lasting just forty five minutes, while longer ferry routes from Japan to Shanghai are also on offer. For more information, please visit our Ferries from Incheon to China page. For more information, please visit our Ferries from Hong Kong to China page. For more information, please visit our Ferries from Macau to China page. For more information, please visit our Ferries from Japan to China page.